Dragon Door’s new HKC line of kettlebells are made with an iron core covered with an advanced polymer that ensures a lifetime of use. Safe to use on any flooring and outdoors in any weather. The carefully-engineered grip provides just the right amount of surface to ensure pain-free hands and minimal discomfort. 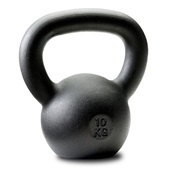 The 10 lbs HKC Kettlebell is an excellent choice for light mobility work, warm ups and for exercises like the Get-Up or Bottoms-Up Press when first learning those technical moves. Ideal as part of the starter tool box for young adults, the out-of-condition, seniors and for some ladies without prior strength training. How sure are we that HKC Kettlebell - 10 lbs will work for you? 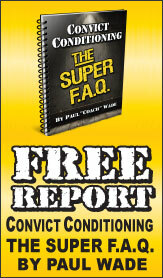 Simply fill out the form below and put HKC Kettlebell - 10 lbs to work for you right now. 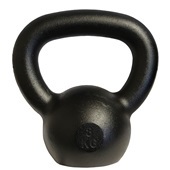 Obviously, we would go out of business if HKC Kettlebell - 10 lbs didn't work, the way we said, right? With the promise of a full refund if you're unsatisfied, you have nothing to lose by trying HKC Kettlebell - 10 lbs. Go ahead and try it today. Got 2 of these on sale & they are great. Very high quality. Would definitely recommend. This is my third kettlebell to add to my apartment set in addition to my 60 and 26 lbs and love this cheery little red one! Perfect for warm up halos and get ups! Handle small and great for my grip. Perfect size for warm ups and entry into new motions. Great balance. 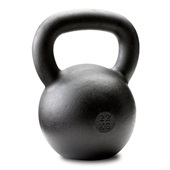 I have throughly enjoyed this kettlebell. 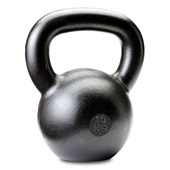 I love the feel of this kettlebell; great for Get-ups in that I am over 65. Good design for home use.